15th. June at Grovehill Community Centre. She is offering Aura Photography. Read her fascinating article below. 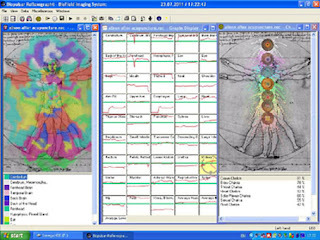 This article is about a piece of ‘Biofeedback Equipment’ that works on the reflexology points of the hand called the Aura Med Biopulsar-Reflexograph. 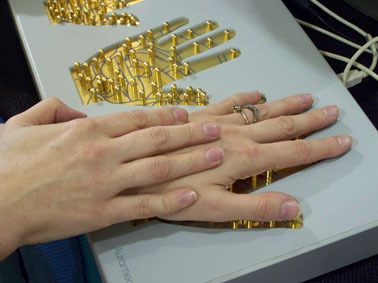 The client places their hand on a hand plate (see Fig 1) containing metal probes that all relate to the reflexology points on the hand, which in turn relate to the internal organs, endocrine system, meridians, chakras and colours of the aura. The chakra Graph looks at the client’s readings compared to an average reading (shown in percent), this shows if the energy is excessive, deficient or balanced. Brow to Crown Chakra is 65% upwards. This indicates where there are blockages are in the body. I often see there is excessive energy stored in the solar plexus along with deficient energy in the throat, this often relates to a person who bottles up their emotions and has problems communicating them to others. If the three bottom chakras are open (the base, sacral and solar plexus chakras) but top three chakras are more closed (throat, brow and crown chakras) this normally indicates that the client is more “down to earth”. When the opposite is true i.e. the top three chakras are more open (the throat, brow and crown chakras) and the bottom three chakras are more closed (the base, sacral and solar plexus chakras) this indicates that the client has a tendency to “day dream” and is less grounded and more interested in spiritual matters. The heart is always classed as the balance line or the connection between the physical and spiritual worlds. The organ graph links up with what the body is trying to communicate with us about our emotional, mental and physical health. This often indicates a client’s known medical problems which are normally disclosed during the reading as Holistic Therapists are not allowed to diagnose. The graphs show which organs are over functioning i.e. tired, over worked, need a rest, a tonic, pick me up etc and also which ones are under functioning i.e. showing possible pain, tension, inflammation, possible ailment or sluggish, this often needs a kick start or herb to get it working. Where the organ’s graph starts low and gradually moves upwards towards the average line it is sluggish and where the graph starts above or on the average line but gradually drops, the organ is not holding energy. If an organ is showing signs of holding stress the lines will go up and down. 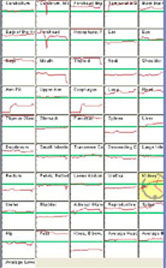 I can analyse the meridians by looking at which organs fall on which meridian lines. I can also look at organs in relation to key body systems, to check hormone balance etc. You can tell if a person is stressed, living on nervous energy or very emotional .I can determine what’s holding the client back (hip, knees, legs and feet) or what they may want to do, to move forward (colours in leg area). The colours of the aura (see Fig 5) can be used to offer colour psychology readings. The head area showing the mind and spirit, the middle area showing the emotions and the leg area showing the physical body. I analyse what the colours mean and why. The body can be used as a timeline to pinpoint when emotional problems started and if they are caused by a male or female in the person’s life dependent on what side of the body they are seen. Personally I use the system for a health and lifestyle analysis. It is great tool for counselling and life coaching. I often offer EFT or healing using the Emotion Code to help release trapped emotions in the client. The system can also be used for colour torch therapy as well; their torch system is the Chromalive. I feel this camera compliments any therapy practiced, it can be used with Mind Therapies like Counselling, NLP, EFT, CBT etc. Physical Therapies like colour therapy, crystal healing, reflexology, reiki etc. Nice Post! !Thanks for sharing this. Aura photography is a visual image of how we are functioning. Aura photography is a visual picture of how we are functioning. Our knowledgeable and reputable team can perform readings and aura photography during your visit. For more information about Aura Photography please visit to our website.